Members of a group that rallied downtown Tuesday refused to identify the person who organized the gathering. 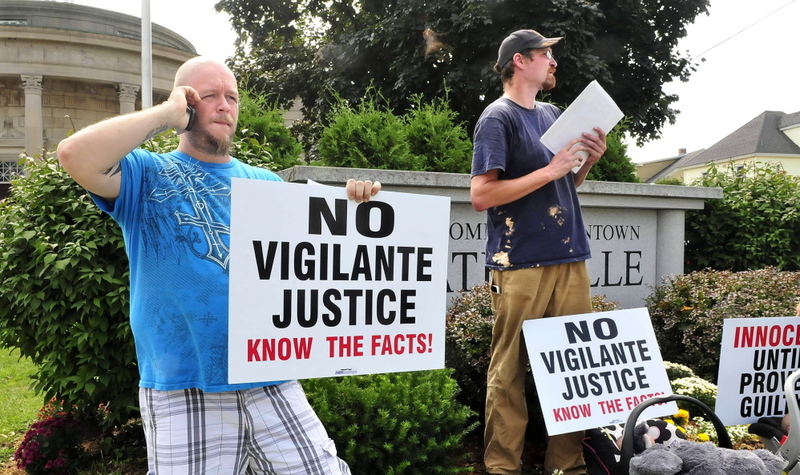 WATERVILLE — Placard-holding protesters held a small downtown rally Tuesday urging passers-by not to judge the police officer who shot Michael Brown to death in Ferguson, Mo., until all the facts are known. The several protesters walked on the sidewalk at the intersection of Main and Elm streets downtown, carrying professionally made signs that said “Innocent Until Proven Guilty” and “No Vigilante Justice: Know the Facts.” They said police officer Darren Wilson, who shot Brown, is being targeted prematurely and unjustly. Gruhn, who said he installs floors for a living, said a friend, whom he would not name, organized Tuesday’s demonstration. “I’m not supposed to be giving out names,” he said. Joseph Levesque, 30, of Fairfield, said police should have recorders on their persons so exchanges between officers and the people they confront are available after such events occur. “The audio will make a difference in my book, so they can hear what’s said. Then, there’s no hearsay,” said Levesque, a bouncer and bartender at the Bob-In. Jennifer Fletcher, 39, of Waterville, said she is studying criminal justice in online courses and believes someone is innocent until proven guilty. “They need the whole true facts on both sides, because nobody was there except the two people (Wilson and Brown),” Fletcher said. Another demonstrator, James Hawkins, said he does not know all the facts in the case, but people should learn all they can before pointing fingers. Some motorists passing through the busy intersection of Elm and Main streets and College Avenue yelled out at the protesters. Efforts to identify the source of the organized protest Tuesday were unsuccessful.